All-natural, the African Black Soap by Natural Cosmetics is packed with iron and vitamins A and E to reveal your skin’s true beauty. Versatile, this product can be used as a shampoo, too! 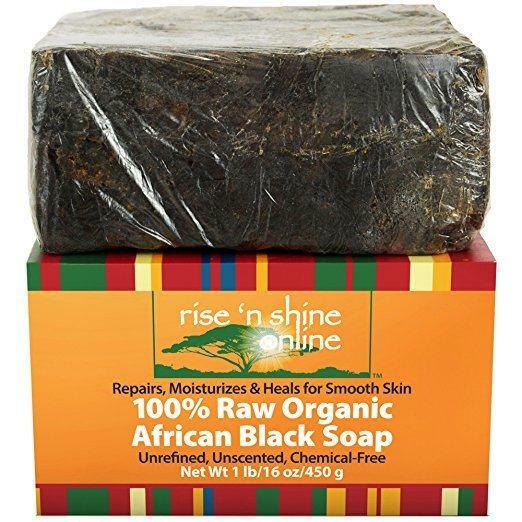 The solution to all skin problems, the 100% Raw Organic African Soap by rise ‘n shine online is packed with ingredients that promote skin health. They also offer a money-back guarantee. Great for all skin types, the Black Soap by Dudu-Osun helps in bringing damaged skin back to life. Its antibacterial properties help lighten dark spots and prevent acne, psoriasis, and eczema. The Premium Raw African Black Soap by Our Earth’s Secrets is another brand that can be used as a shampoo. But since it is raw, it is ideal to lather it first and not apply it directly on the face. What makes the African Black Soap by smellgood a stand-out brand is that it comes in paste form. It deeply cleanses the skin to help fade dark spots and keep acne from coming back. Rich in skin-loving nutrients, this best black soap for acne is the answer to all skin problems. A must in any natural skincare routine, this soap leaves skin a radiant glow everyone will notice. When used on all parts of the body, this soap helps improve skin texture and lighten dark spots and hyperpigmentation. It is very easy to handle and isn’t harsh on the skin, unlike other brands. An impressive thing about this soap is that it offers results after a few uses. It was mentioned that this product helped clear a customer’s acne in just 3 days after dealing with it all her life. Great for sensitive skin, this product will not cause any breakouts. When used as a shampoo, it helps reduce the production of oil and thus, helps control frizz to make hair more manageable. This soap suds up easily and produces a nice amount of lather. A little goes a long way, so it is advised to use a minimal amount (enough to coat your fingertips) since it’s literally all you need. Great for all skin types, this best black soap for dark spots slows down the aging process minus the harsh chemicals. It is antioxidant-enriched to prevent sagging skin and premature wrinkles. Filled with skin-friendly ingredients, it doesn’t have any ingredient that will put your skin’s health at risk. The company believes you should be able to eat the ingredients you put on your face. The Shea butter content of this soap leaves skin smooth and soft to the touch. Since it has vitamins A and E, this ingredient strengthens the skin and promotes the renewal of healthy cells. The consistency of this soap is hard yet firm enough that when it is dropped, it will crumble into bigger pieces easily. It also suds up easily, creates a fair amount of lather, and goes a long way. This soap helps improve any skin condition, whether it be acne-prone, psoriasis, or eczema. It even helps improve skin tone, with a review stating it showed visible results in only 3 weeks. Can be used as a shampoo, too! Packed with antibacterial properties, this best black soap prevents dark spots, dermatitis, and even acne. This product is great for all skin types and can help with a number of skin conditions. This black, oblong-shaped soap is huge and should last at least thrice longer than traditional soap. Infused with Shea butter, this product creates a foamy lather and suds up quickly in water. This versatile product is used by customers in three ways: for the face, for the body, and for the hair. However, it is stated on the website to not use it as a shampoo as it can dry out the hair. Great at removing excess grease and dirt, this product can be used as a makeup remover as well. Simply dilute some small pieces and transfer it to a spray bottle, and you’re good to go. What’s even great is that this soap helps eliminate blackheads as well. We just find it to be a bit drying at first, but we think this is possibly because of the soap’s lime juice content. This best brand of African black soap is great for all skin types, even for sensitive skin. It fights the signs of premature aging like wrinkles and fine lines and also works as a makeup remover. This brand uses the traditional recipe of Africa and is made from Ghana. It also observes the fair trade program, so with each product you buy, you are doing your part of helping the community. A little of this product goes a long way as it produces a good amount of lather. And unlike other brands, this product is easy to divide into smaller pieces because of its soft (yet firm) texture. A lot of customers are obsessed about this soap and say that it’s the real deal. It is, however, advised to not rub the soap directly to your face since its gritty texture can irritate facial skin. When you take it out of the package, it is definitely not one of those visually-appealing soaps. But we guarantee it works wonders: and besides, isn’t quality more important than how it looks? Great for all skin types, this product can make skin feel super soft after the first wash itself. It helps control oil production so if ever you feel dry, we recommend moisturizing immediately- just to be safe. This product does not cause any irritation in acne-prone, sensitive skin. It also offers immediate results, so if you’ve been dealing with acne all your life, this baby right here is the answer. Men even find this product helpful with their razor bumps. This soap clears you off your razor bumps overnight (no joke) that some even find the results astonishing. A great product for your cleansing regimen, this soap can help minimize enlarged pores and make skin feel tighter. But as mentioned it can dry out skin, so remember to use it sparingly. Soaps available in the market today are filled with toxic chemicals that may be doing your skin more harm than good. For a more natural alternative, why not try African Black Soap? Packed with antioxidants, this soap usually consists of palm oil and leaves, cocoa pod, and plantain skin ashes. Other brands include Shea butter for extra moisturization. This is because pure black soap can dry out skin. There are countless ways on how African black soap can benefit you, and we will be listing down some of them today. This is thanks to the soap’s antioxidant-rich property. These help us against the signs of premature aging like fine lines and wrinkles. African black soap helps improve overall skin appearance for a more glowing and smoother skin. This soap evens out the skin tone and helps with dark spots and some skin discolorations. This soap aids in reducing inflammation such as rashes, flaky patches, and dry, sensitive skin. Acne is one of the many skin conditions this soap can help with. Aside from clearing acne, some even claim it has helped remove their blackheads, eczema, and psoriasis. Its antifungal and antibacterial qualities make this soap perfect for giving pores a deep clean. The butters and oils it contains make it great as a makeup remover as well. The ashes contained in African black soaps are effective in the removal of dead skin cells and thus, softens skin and improves fine lines. This is because most African black soaps contain Shea butter. This ingredient is known for its moisturizing benefits and ability to give skin a healthy glow. There are countless ways on how our skin can benefit from using African black soap. But with a lot of options to choose from, how do you know which brand truly delivers? The African Black Soap by Natural Cosmetics is our highly-recommended product as the best African Black Soap. All-natural, this vitamin-enriched deep cleanser is great for dry and skin prone to acne. And as the company says, will leave your skin saying “ooh la la…” This product is also very cheap so you can treat your skin with its benefits any time you want.